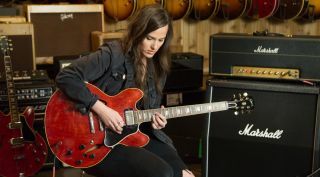 See the legendary 1964 Gibson ES-335, famously used during Clapton's years with Cream, in action. Showtime has revealed the trailer for 'Eric Clapton: Life in 12 Bars,' a documentary the network produced on the life and work of the guitar legend. You can watch it here. Eric Clapton, the guy who played lead guitar on Ringo Starr's "Everybody's in a Hurry But Me" in 1983, turns 72 today. Last night, Eric Clapton kicked off a two-night run at New York City's Madison Square Garden. Fifty years ago today—March 13, 1965—guitarist Eric Clapton quit the Yardbirds. It's one of the best things that ever happened—period. There's a new Eric Clapton documentary in the works. We have one more bit of Grammy news for you. Former Cream drummer Ginger Baker is recovering from heart surgery, the MirrorUK reports. This morning, the crew over at RollingStone.com premiered a new recording by former Kiss guitarist Ace Frehley.You can hear the song, a cover of "White Room," the classic 1968 Cream track, below.